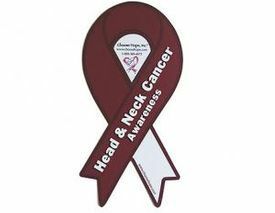 Popular ribbon design, our Head and Neck Cancer and Head and Neck Cancer awareness ribbons are magnets and great for your car or home. They're 8 inches tall and read "Head and Neck Cancer" on one of the legs. These also have a 2-in-1 feature - a pop out central part that is a separate magnet itself. Great for keeping at home while your other is on your car. Measures 8 inches tall by 4 inches wide.